Hope you enjoyed the long weekend Maharani's! 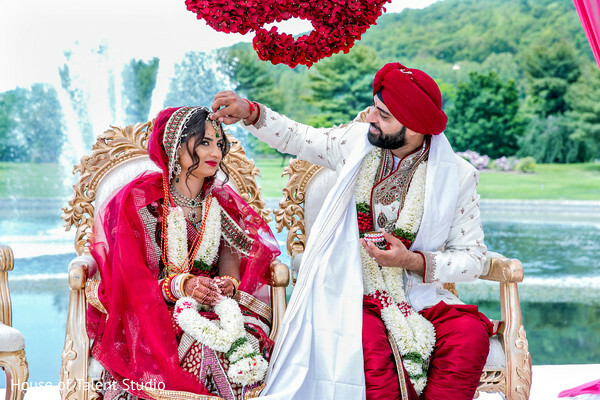 Today, we bring you a waterfront Sikh ceremony that any Roman goddess can come to appreciate at the Sheraton Mahwah Hotel! 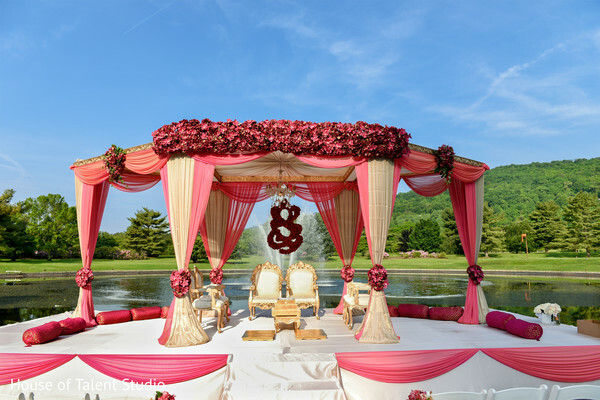 This unique ceremony was held outdoors in front of a sparkling fountain in a mandap adorned by flowers in a spectacular hue of fuchsia decorated by Elegant Affairs. 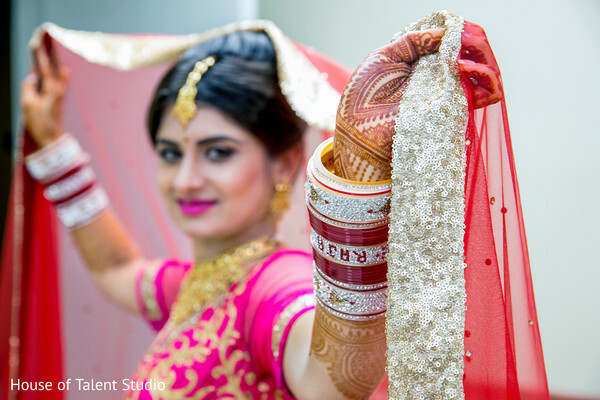 Maharani Sheena cascaded her beauty, perfected by Cinderella Bridez, in not one but two dazzling lenghas that was captured beautifully on camera by the astounding House of Talent. Touch of Elegance Event Planners designed the event to perfection! 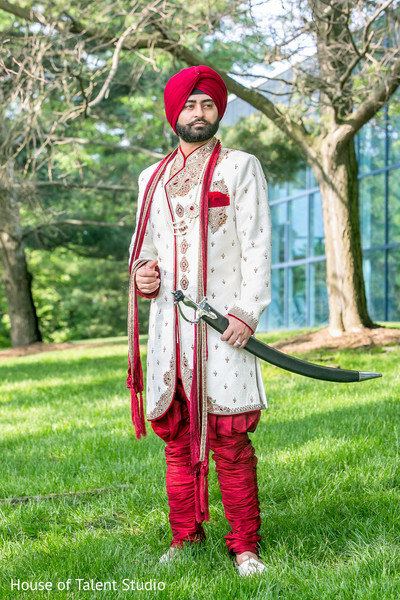 I was completely captivated by the choice of transportation groom Raja chose for his bride. An antique car is an AMAZING way to celebrate your special day and M&V Limousines Ltd. delivered! This couples’ gallery is ready for your viewing pleasure and make sure you check back to see photos of the smoking reception party! Yet another beautiful Sikh Ceremony in the books! 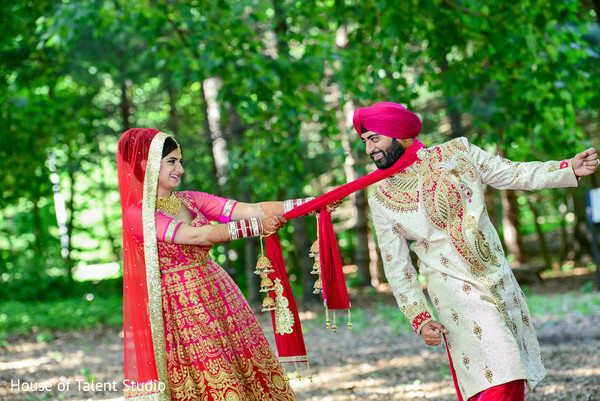 As always, stay tuned for more wedding gorgeousness! 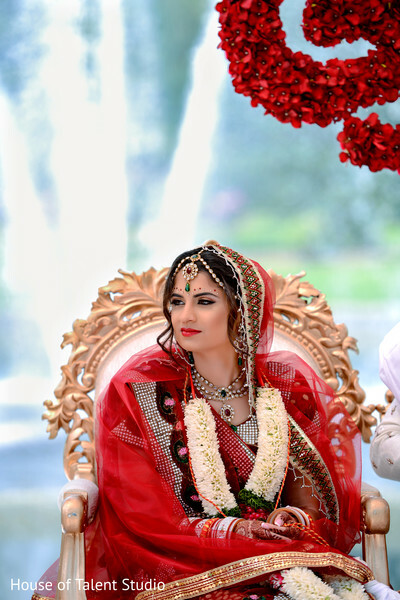 Floral & Decor: Elegant Affairs Inc. | Cinematography: House of Talent Studio | Hair & Makeup: Looks by Jassi | Venue: Sheraton Mahwah Hotel | Cakes & Treats: Candy Bar: Touch of Elegance Event Planners | Catering: Rasoi | DJ: DJ Sunny | Hair & Makeup: Cinderella Bridez | Baraat: Dream Horse Carriage Company | Ice Scuplture: Jimmy’s Artistic IceSculptures | Transporation: Helicopter Wings Air helicopters Charter | Transportation: M&V Limousines Ltd. Elegant Affairs Inc., House of Talent Studio and Looks by Jassi are members of the Platinum Guide. Love what you see? Explore their portfolios.